This is not a breed for those that do not enjoy grooming! 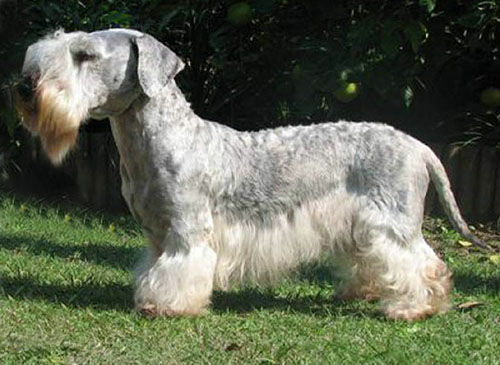 Because the coat keeps on growing and does not shed, if a Cesky Terrier is not clipped regularly he will look like this in a few months. Without regular and careful grooming, an unclipped coat becomes very matted and the dog will be uncomfortable - and smelly! He may even be restricted in movement. It is essential to groom the coat through regularly, paying particular attention to the area inside the elbows, under the chest and between the back legs. Many owners of pet or working terriers find it easier to keep the furnishing fairly short - especially in winter. However, the traditional clip, designed to show off the combination of elegance and sturdiness that epitomises the Cesky Terrier, is not too difficult to maintain. 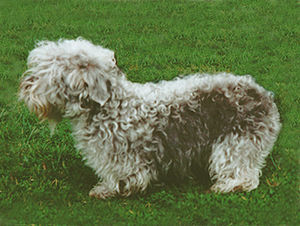 The coat is always trimmed by clipping, rather than by the hand-stripping that is required to maintain the look of the more harshly coated terriers. 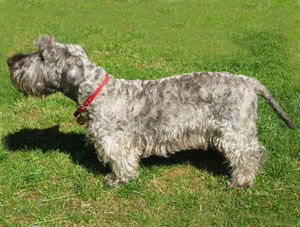 The coat of the Cesky Terrier is silky and should have a metallic sheen. The furnishings should not be too profuse. The hair on the body is left slightly longer than that on the head, shoulders and quarters. There is an excellent guide to grooming the Cesky Terrier on the Kennel Garex website, whilst the photograph below shows how to prepare a Cesky Terrier for the show ring.